Our C-124 mission was to onload radar components located at Sioux City, Iowa and deliver them to St. Lucia, second largest of the Windward Islands. 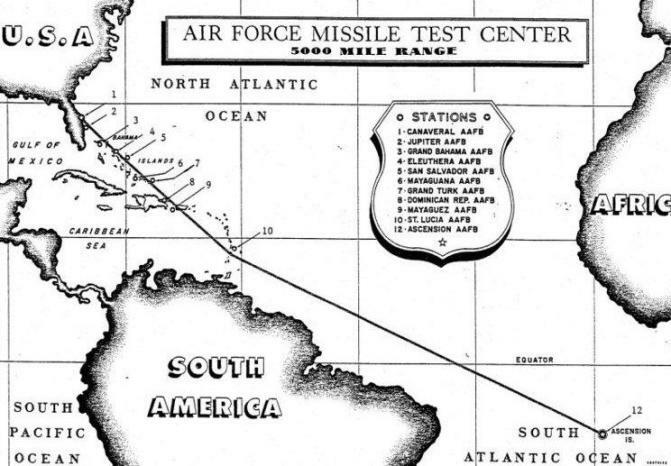 In October 1952, the Air Research and Development Command’s plan was to extend the Air Force’s Eastern Missile Test Range to a distance of 5,000 miles to meet the SNARK and NAVAHO intercontinental missile test requirements. Antigua, St. Lucia, Fernando de Noronha and Ascension were selected as the host sites and agreements were negotiated with the governments of Britain, St. Lucia, Brazil and Ascension to authorize construction of the necessary equipment for flight following. The St. Lucia and Ascension agreements were signed on 26 June 1956 and the Brazilian agreement was signed on 21 January 1957. Britain granted the U.S. access to Antigua on 15 January 1957. The St Lucia site was activated on 5 December 1956 and the sites at Antigua and Ascension were ready for operation in October 1957. The Fernando de Noronha station activated off the coast of Brazil on 18 September 1958. So on 13 April 1956 we departed Dover AFB in our C-124 and seven hours later we landed in Sioux City. Arriving in the middle of the night, we found that our contact was not available until the following morning so crew rest was in order. Not landing at a military installation, we were quartered in a hotel downtown. Finding a place for liquid refreshments and sustenance in town at 2:00 am was not easy. However, we did find a watering hole whose proprietor said, “As long as there’s a dollar on the counter I’ll stay open.” It was obvious he was not aware of the refreshment requirements of a MATS aircrew. The first leg of our flight to St. Lucia from Sioux City took us to Warner Robins AFB, Georgia and then on to Ramey AFB, Puerto Rico for refueling and crew rest as there would be no aviation fuel available at St. Lucia. Ramey in the 1950s was a bustling hive of activity as the Strategic Air Command (SAC) was the host with their B-36 Peacemaker bombers. SAC would remain at Ramey until the mid 1970s. In March 1960, both Ramey and Roosevelt Roads Naval Air Station were the destination points for the MATS airlift exercise “Big Slam/Puerto Pine” in which 22,000 combat-ready troops and 12,000 tons of equipment were airlifted from fourteen stateside bases. Of the more than 50,000 hours flown, Dover’s C-124 and C-133 aircrews flew 10,305 hours. Although successful, then MATS Commander Lt Gen William Tunner proved to Congress that military airlift was in need of an overhaul as the exercise proved that such an “operational airlift” would be unsustainable and that MATS should be upgraded to a command in view of its strategic importance and receive funding as necessary. Eventually the Military Air Transport Service became the Military Airlift Command in 1966. From Ramey it was off to our final destination at Beane Field, St. Lucia with a very tricky approach and landing. Beane Army Air Field was activated on September 28, 1941 near the town of Vieux Fort, and hosted the 5th Bombardment Squadron which flew B18 “Bolo” medium bombers flying anti-submarine patrols. The facility was renamed Beane Air Force Base in 1948. It was closed on 28 May 1949, as a result of budgetary cutbacks, with right of re-entry retained by the United States. The former USAF base was then refurbished and converted into Hewanorra International Airport. Today, St. Lucia is advertised as an “Exotic Paradise Beyond Compare”. During our mission briefing at Dover, we were informed that upon arrival at St. Lucia we were not to fly over the island commissioner’s house and to be aware of livestock on the runway. In the interest of good relations with the government of St. Lucia, the natives were allowed to graze their livestock along the edges of the runway; however, the airstrip was not fenced off and after several low passes down the runway we finally were able to land having scarred off the unattended cows and sheep. Following the offload of our cargo, it was then back to Ramey for refueling and then on to Dover having logged a total of thirty hours flying time. The term “downrange” came into use at Cape Canaveral in the 1950s. It refers to the chain of island tracking and telemetry stations originating at the Cape that is now called simply the Eastern Range. Many of the original tracking stations have disappeared, replaced by more modern methods of controlling and tracking missile flight. This early map defines the downrange chain from those early days. The Eastern Range now supports missile and rocket launches from Cape Canaveral Air Force Station and the Kennedy Space Center, Florida. The range also supports launches from the Wallops Flight Facility located on the Delmarva Peninsula. Thanks to Patrick AFB for some of the information used in this composition.